Guests of Hamilton-Turner Inn will encounter warm Southern hospitality no matter what they do in and around the Savannah Historic District. 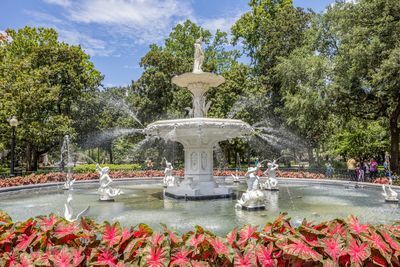 Our Savannah, GA bed and breakfast sits on beautiful Lafayette Square, steeped in history and enveloped by romance and relaxation. We offer guests luxury accommodations, friendly service and convenience to the treasures and rich history of our city. 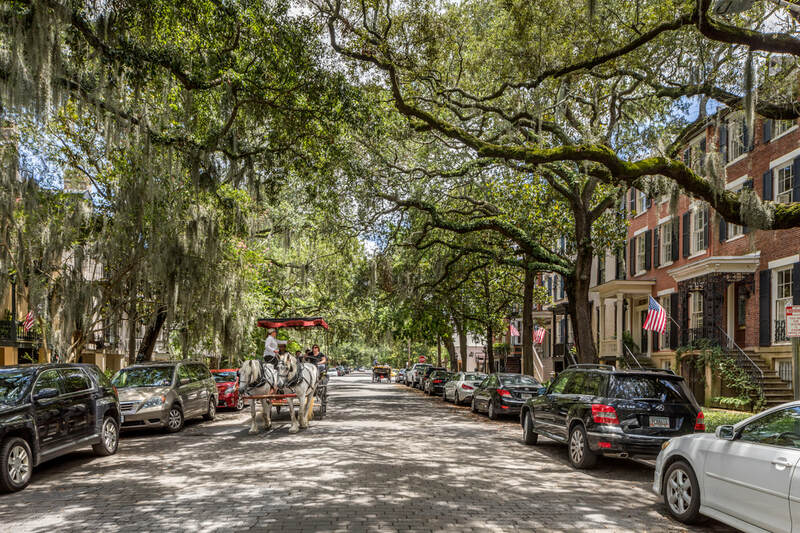 From its unparalleled Southern dining and antique shopping to the historic museums, ornate cathedrals and romantic things to do like carriage rides and walking tours, Savannah promises a true Georgia experience. ­Hamilton-Turner Inn, dating back to 1873, is a rich part of Savannah’s history. Our bed and breakfast sits in the heart of the Savannah Historic District in downtown. The area is one of the largest National Historic Landmark Districts in the United States and offers a number of attractions that reflect the makeup of the oldest city in Georgia. The structure was rebuilt in 1890 after a fire destroyed the original cathedral constructed in 1854. The “mother church” of the Catholic Diocese of Savannah boasts unique stained-glass windows, pews carved of Flemish oak and a bishop’s chair situated to the left of the altar. Congregation Mickve Israel in Savannah, Georgia, is one of the oldest in the United States, as it was organized in 1735 by mostly Sephardic Jewish immigrants of Spanish-Portuguese extraction from London who arrived in the new colony in 1733. The church was organized in 1773 under the leadership of Reverend George Leile. In December of 1777 the church was officially constituted as a body of organized believers. Under the leadership of the 3rd Pastor Reverend Andrew C. Marshall, the congregation obtained the property where the present sanctuary stands. Marshall also organized the first black Sunday school in North America and changed the name of the church from “First Colored Baptist” to “First African Baptist”. Established in the eighteenth century, Colonial Park Cemetery is the final resting place for many of Savannah’s earliest citizens. The cemetery is a popular stop for local ghost tours as it is home to one of Savannah’s most famous ghosts – Rene Asche Rondolier. The 1994 John Berendt novel and 1997 Clint Eastwood-directed movie “Midnight in the Garden of Good and Evil” featured this public cemetery on a scenic bluff of the Wilmington River. Immediately inside the gates is “Gaston’s Tomb.” East of Savannah and about 15 minutes from Hamilton-Turner Inn, the cemetery offers guided walking tours. This beautiful brick house was completed in 1849, built by New York architect John Norris for wealthy cotton factor Andrew Low. Guided tours include interiors adorned with ornate plaster cornices and wood carvings, a stunning brick-walled garden behind the house, a front garden and one of the city’s most magnificent iron balconies. Hamilton-Turner Inn serves one of the best breakfasts in Savannah in its elegant Dining Room. Enjoy hearty culinary treats while views of historic Lafayette Square encompass you. Our chef prepares everything from pulled pork biscuit served with tomato jam and Peach Praline French toast with real whipped cream while ensuring the freshest and finest ingredients are used. We also bake fresh pastries each day. For lunch, dinner and cocktails, our bed and breakfast is within walking distance to a number of exceptional restaurants in and around the historic district. Occupying a 1938 art deco Greyhound Bus Terminal that they painstakingly restored to its original luster, The Grey offers a food, wine and service experience that is simultaneously familiar and elevated. Located in the heart of the Historic District, Husk features the culinary creations of James Beard Award-winning Chef Sean Brock, who celebrates the rich essence of Southern Cuisine and the unique bounty of coastal Georgia in every dish. The restaurant is set in a beautifully renovated mansion and offers an immersive exploration into what it means to cook, eat and live in Savannah. A popular dining spot in Savannah, The Olde Pink House is the city’s only 18th century mansion and offers live entertainment nightly. The Olde Pink House was designed by Thomas Jefferson and his brothers. It is also where the first public reading of the Declaration of Independence took place. A historic and beautiful place with exquisitely decorated rooms, The Olde Pink House offers inspired Southern cuisine in a breathtaking colonial mansion. Fusing modern techniques with traditional arts like sausage and pâté making, breads from scratch, and grinding our own meat for burgers, we embrace the rich past of our craft while carving our own history with a unique blend of flavorful offerings. The Collins Quarter opened in 2014, and brings Australia’s café capital to Savannah. Styled after Melbourne’s historic Collins Street. If you’re looking for an intimate and quiet place to dine, then the Noble Fare is an excellent choice. The Noble Fare offers a dark, elegant setting like that of a chateau dining room. It is nestled near the city’s beautiful parks, cultural venues, and art galleries. Local Southern cuisine with a historic charm, the Noble Fare is a go to place for that romantic night out. A.Lure is in the heart of the historic district and its contemporary approach to classic southern recipes compliments the rustic, modern atmosphere you’ll find there. With a combination of low-country gourmet, fresh seafood, and a farm-to-table, a.lure puts a delightful twist to traditional southern and seafood dishes while providing a unique dining experience in downtown Savannah. The menu changes daily at 107 West Jones St. Large tables for 10 are shared by friends and strangers alike as they enjoy old-time family-style dining. At the Hamilton-Turner Inn, you will find a wide selection of local stores, art galleries and boutiques to satisfy your shopping needs. We are within walking distance of all that downtown Savannah has to offer. 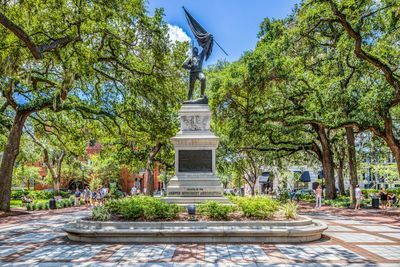 From specialty chocolate shops to unique bookstores, you will discover why Savannah is a premier destination spot not only for the history but the shopping as well. 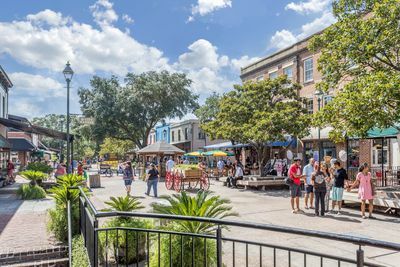 Savannah’s Downtown Design District can keep you busy for an entire day. The cluster of locally owned shops and boutiques in the middle of the Historic District offers a walkable shopping spree for antiques, gifts, clothes, fabrics, specialty papers, and furniture. The off the beaten path location between Drayton and Whitaker from Liberty Street to Gordon Street offers plenty of parking, shade, and an opportunity to hit Mrs. Wilkes famous boarding house on Jones Street for lunch while you’re there. The Broughton Street Collection blends Savannah’s Southern charm and easy-going elegance with the emerging trends and style driven by unique chef-driven restaurants, retailers and fashion forward thinkers. City Market is a charming 2 block area surrounded by eclectic retail shops, art galleries, nightlife and restaurants. By day, stroll the shaded courtyard between two Savannah squares, surrounded by bistros and galleries, serenaded by local musicians. By night, join the genial crowds for concerts and cuisine. Adam was named one of the Top 10 Chocolatiers in North America by the industry’s leader publication: Dessert Professionals. The Paris Market, is a storehouse of treasures. This irresistible invitation to shop the world’s most exotic and exclusive markets. Carol’s is Savannah’s premier women’s apparel & accessories boutique serving you for 26 years! Building relationships with your family and the community is why we have been so successful for all of these years. For those of you who are just discovering Levy Jewelers, we will strive to earn your trust and confidence every day! We invite you to visit us soon and see why we are Savannah’s premier jeweler. 24 E is an eclectic collection of furnishings & accessories as individual & inventive as you are. American Leather, Lampe Berger, Nuevo, and Norwalk, and more! Savannah Bee Company is home to the world’s finest honey and naturally luxurious health & beauty products. The Salt Table is a top place to shop in Savannah. It’s a truly unforgettable! Experience featuring 100s of tasting samples and even GA made wines with a GA wine tasting bar. Savannah’s fitting tradition for men and women since 1892! Featuring footwear and accessories by Stuart Weitzman, Donald Pliner, Cole Haan, Sam Edelman, VanElli, Thierry Rabotin, Gentle Souls, Munro, Jeffrey Campbell, Ugg, Ecco, Mephisto, Think! Are you looking for a day excursion while staying at the Hamilton-Turner Inn? No problem. We have several nearby travel destinations that you’ll want to explore during your stay. South Carolina is just minutes away if you want to check out some of the local history or go to Hilton Head Island where they have fun beaches and shops. Or if you want to see where the locals go especially on a hot summer day, visit Tybee Island, a small beach town with a wide array of shops and attractions. We’d be happy to help you plan your mini-adventure! A Low Country resort town located on an island of the same name in Beaufort County, South Carolina, USA. It is 20 miles north of Savannah, Georgia. The island gets its name from Captain William Hilton. In 1663, Captain Hilton identified a headland near the entrance to Port Royal Sound, which he named “Hilton’s Head” after himself. The island has a rich history that started with seasonal occupation by native Americans thousands of years ago, and continued with European exploration and the Sea Island Cotton trade. It became an important base of operations for the Union blockade of the Southern ports during the Civil War. Once the island fell to Union troops, hundreds of ex-slaves flocked to Hilton Head, which is still home to many ‘native islanders’, many of whom are descendants of freed slaves known as the Gullah (or Geechee) who have managed to hold onto much of their ethnic and cultural identity. Located between Savannah, Georgia and Hilton Head, South Carolina is Daufuskie Island. This five-mile stretch of land is known for its white, sandy beaches, historical landmarks (such as ancient piles of oyster shells that symbolize the residents’ love of the food), and being cut off from the surrounding Low Country. Accessible only by boat or ferry from Savannah or Hilton Head, Daufuskie’s main mode of transportation is golf cart. A trip to this island offers visitors the chance to step back in time, disconnect, and reconnect with family and friends. Most native residents are descendants of freed slaves, who have made their living from the abundance that the water has to offer. The water also holds many activities for visitors from kayaking to sailing, crabbing to fishing charters, cycling tours to picnics on the beach: Daufuskie Island is a community steeped in nature. Tybee Island, also known as Savannah Beach, is an easily accessible barrier island located just 18 miles away from the Hostess City of the South, historic Savannah, Georgia. Savannah’s Beach is an amazing tourist destination that has something to offer every vacationer. Rich in both history and natural beauty, Tybee Island is also famous for its diverse cuisine and a variety of exciting recreational activities. After its founding in 1852, Bluffton became a popular location for wealthy Savannah merchants and plantation owners. Following the Tariff of 1842, Bluffton became a hotbed of separatist sentiment. In 1844 the Bluffton Movement, a protest against federal taxes, birthed the secession movement and led South Carolina to be the first state to leave the Union. Located just across the bridge from Hilton Head Island, Bluffton is a quaint, charming town. Antebellum homes, historic churches and unique shops line the moss-shaded streets of Bluffton’s downtown historic district, offering a taste of Lowcountry living. Savannah is all about the history. And your stay at the Hamilton-Turner Inn wouldn’t be complete without taking a few tours. In addition to being entertaining, they can be really helpful in giving you a bird’s eye view of the town while providing information of something in particular that piques your desire for further exploration. There are a variety of tours from walking to trolleys and they also concentrate on certain themes. So you’ll find whether it’s history, cemeteries, food or architecture, there is a wide selection of tours to entertain you! Architectural Tours of Savannah is a tour company with walks led by Jonathan Stalcup. Jonathan graduated from the Savannah College of Art and Design with a Master of Architecture degree in 2004. He shares Savannah’s history with both visitors and locals by describing the city’s built environment. Oglethorpe’s original plan, today’s desire to balance preservation with a living city, and almost 300 years in between are presented as a narrative timeline. We want our guests to go beyond the conventional – to gain a new perspective. With Old City Walks, what you’ll discover is endless. Our pace is relaxed, punctuated with Southern civility and local insight. 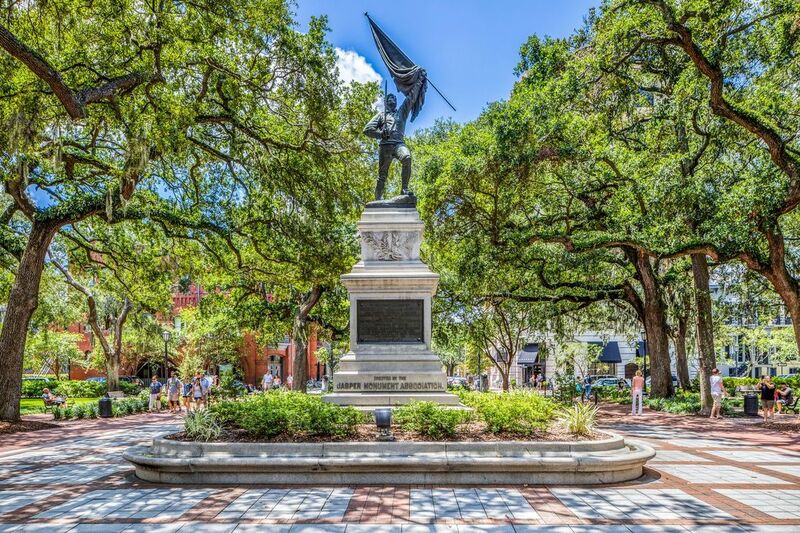 Take a leisurely stroll through Savannah’s picturesque squares with a Southern Gentleman. Hear the rich history of Savannah spoken in the language of the South. See churches and Southern mansions dating back to the 1700s! You’ll visit scenic locations used by Hollywood’s movie industry. See where Forrest Gump sat on the bench waiting on the bus. Get the inside buzz on restaurants and night spots and enjoy Savannah like a local. Established in 1849 Bonaventure Cemetery has been described as a natural garden with live oak trees draped with Spanish moss and thousands of azaleas. Standing within this “garden” are beautiful sculptures of grieving ladies, ornately carved crypts, obelisks and the statue of Gracie Watson. Discover where the locals eat on this one-of-a-kind, three-hour adventure where you could experience fried green tomatoes, Artisan-baked pastries, Southern pork BBQ with signature sauces, fabulous shrimp and grits or handmade gourmet chocolates. “Lights, Camera, Action!” For the past 100 years those words have been heard in and around Savannah, as Hollywood recognized that the ‘Hostess City’ was a perfect backdrop for filming. From silent movies to the original Cape Fear (1962), The Longest Yard (1974), the TV miniseries Roots (1977), Glory (1989), Forrest Gump, Something To Talk About and Midnight In the Garden of Good and Evil (1990s) to The Conspirator and The Last Song (2009), plus the aptly named Savannah, filmed in 2011, are just a few. Our famous 90-minute narrated tour, including numerous film clips, will pass many of the most recognizable locations. This is a ‘must do’ tour for moviegoers of all ages. And maybe a stop at the world-famous Leopold’s Ice Cream for a treat to end your tour? The Historic Overview Tour explores 270 years of Savannah’s history in 90 minutes. The adventure is expanded for the Historic On And Off Tour. The Savannah Experience is a three-hour tour highlighting the familiar sites and haunts of the Historic District while exploring the other “forgotten” neighborhood.